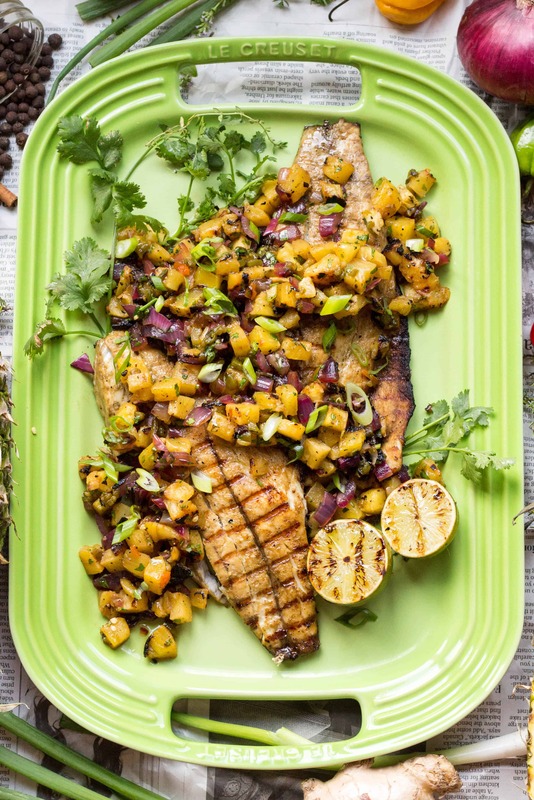 This easy recipe for jerked fish with grilled pineapple salsa is a light and flavorful summertime dinner! 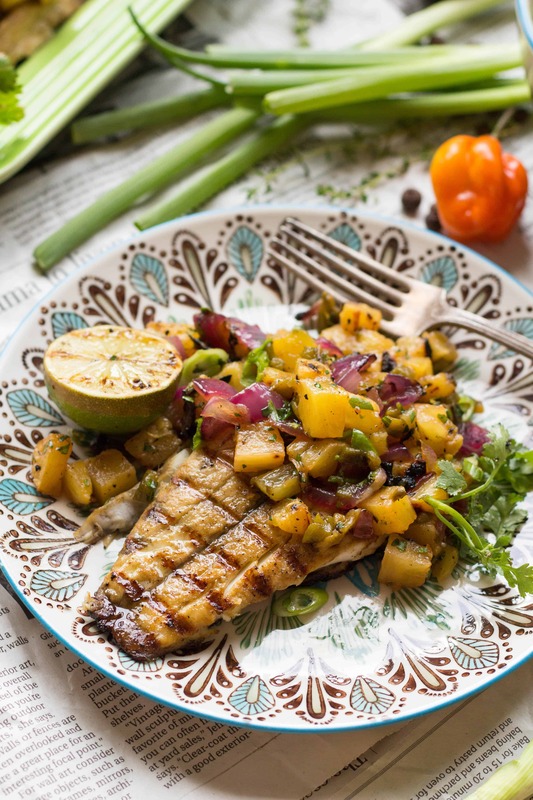 The Jamaican jerk marinade is spicy and smoky, and the grilled pineapple salsa gives it lots of sweet, tangy flavor. Today is an extra special #BarraMonday because we’re debuting an all new look at TheBetterFish.com. The new site is absolutely STUNNING with a simple layout, beautiful photography, and great information about Australis, sustainable aquaculture, and why barramundi sea bass is THE fish you should be eating right now. Plus, you’ll find plenty of super duper awesome recipes, many of which were developed by yours truly. You can even view a quick video series, starring moi, that will teach you several different simple, fool-proof methods for cooking fish at home. Check it out and let us know what you think! Oh, and speaking of new websites, you probably noticed that Coley Cooks is sporting a fresh new look, too. I’ve been working for what seems like ever to clean up the layout and make the site easier to navigate, and over the weekend I finally pulled the trigger and went live. My new logo, designed by Mainstay, features a bulb of garlic with curly scapes and a color palette that will change with the seasons (or my moods). There’s an all new recipe index that makes it MUCH easier to find your favorite recipes, and the new site looks a heck-of-a-lot better on mobile devices. Yay! If you have a moment (it will only take like, two minutes, I swear!) I would love for you to nominate Coley Cooks for a Saveur Blog Award. 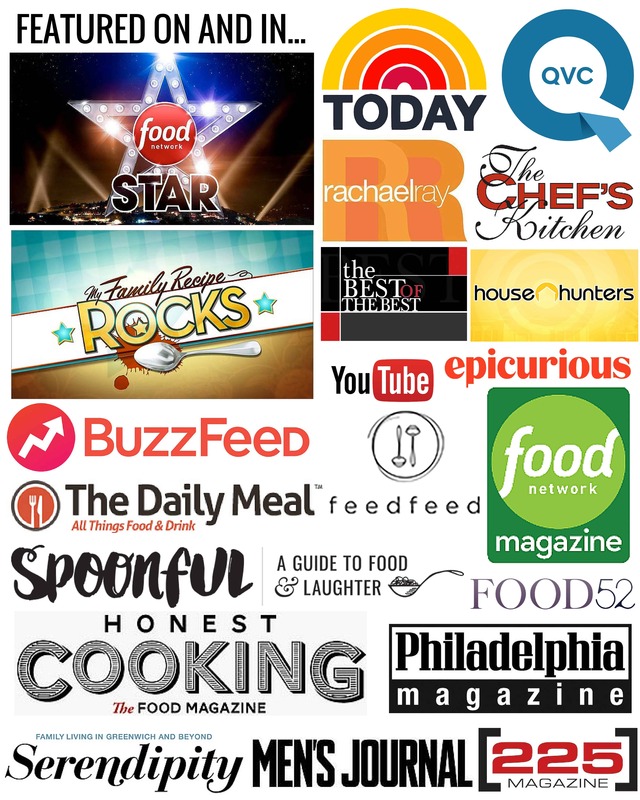 These are the most prestigious awards in the food blogging world, and I would be over the moon if I were ever to be awarded one. I think the video category best suits me, but feel free to nominate Coley Cooks for whichever category you think is most appropriate. Heck, why not even vote a few times for multiple categories?! You totally can, and I would so very much appreciate it. Nominations are open until July 18th, so I’ll be sure to pester remind you again. Please and thank you! Moving on. Jerk! No, not you. The fish! 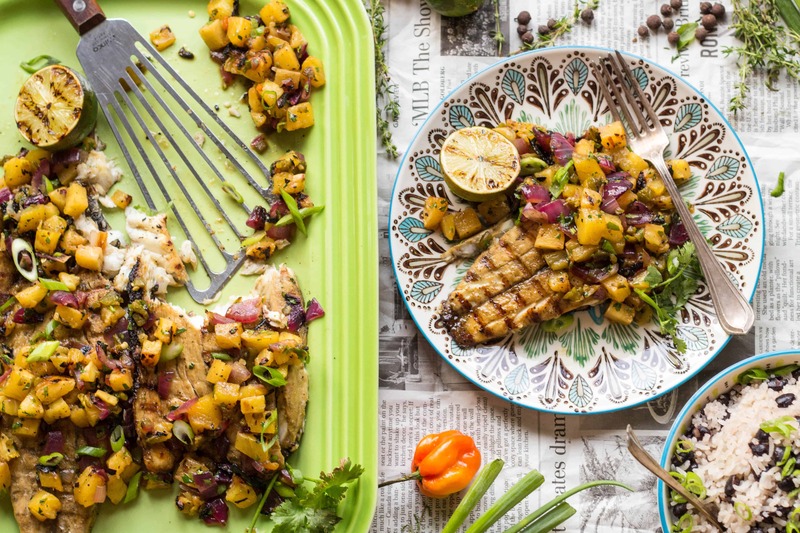 This Jamaican inspired jerked barramundi is the ultimate summer supper. It’s light, fresh and jam packed with flavor. The recipe has quite a few ingredients, but if it’s authentic jerk flavor you’re after, you’re just going to have to accept that. To cut down on time, you could totally substitute a store bought jerk marinade in a pinch, but it’s not going to be quite as good. This one is bold, spicy and a perfect pairing with the sweet, smoky grilled pineapple salsa. I make a double batch of marinade and freeze the rest for another time. This marinade is also great on chicken, pork and vegetables. Not every fish can stand up to the strong flavors of jerk, but the mid oil content and meaty texture of Australis barramduni makes it an excellent choice. It won’t fall apart in the marinade, it won’t dry out on the grill, and it won’t be overpowered by everything else on the plate. I opt to prepare my fish with the skin on, but it’s wonderful without it as well. Did you know most of the omega-3 fatty acids in fish are found in the skin? Get it nice and crisp on the grill and everyone at the table will be fighting for a piece. Australis barramundi is one of the most sustainable choices you can make when it comes to seafood. Many people have come to believe that if a fish is farm raised, it’s garbage, and this is simply not always the case. While there are lots of poorly farm raised fish on the market, they are not all created equal. Australis created a revolutionary farming system that guarantees our fish are raised in the best conditions possible, with little impact on the environment, and without any antibiotics, chemicals or colorants. Learn more here. 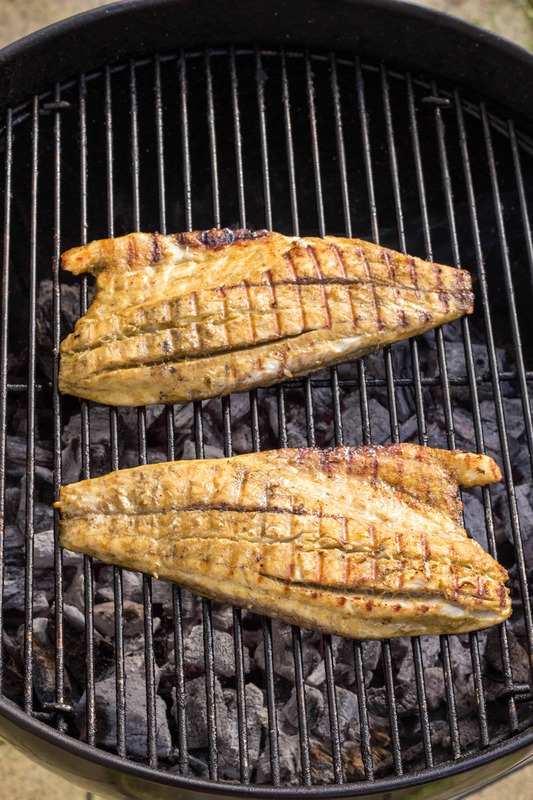 Nervous about grilling fish? Don’t be! Just remember to get your grill nice and hot, make sure it’s cleaned and well oiled, and make sure the fish is well oiled, too. Don’t poke and prod, give it time to cook on one side before flipping and you shouldn’t have any problems. Watch this quick video to see just how easy it is. Make the jerk marinade by combining the scallions, garlic, ginger, scotch bonnet pepper, allspice, black pepper, cinnamon, nutmeg, thyme, brown sugar, orange juice, lime juice, soy sauce, vinegar, oil and salt in a blender. Blend on high until the mixture is totally smooth. Pat the barramundi fillets very dry, then place in a zip top bag and cover with marinade. Seal the bag and move the fish around to be sure it’s all thoroughly coated. Place the bag in the refrigerator and marinate for 30 minutes. 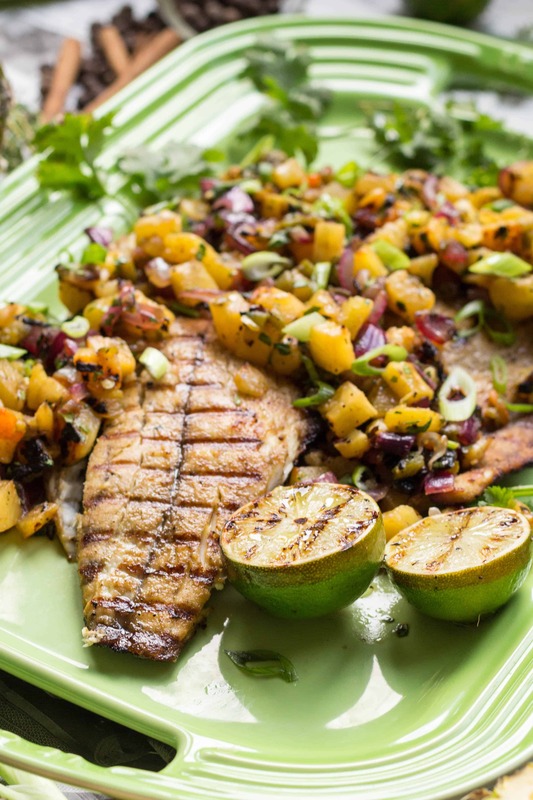 While the fish is marinating, prepare the salsa by preheating a grill** to medium high heat. Cut the pineapple and red onion into 1-inch thick slices, then coat them, along with the jalapeño and limes, with olive oil and season with salt. Place the fruit and vegetables on the grill and allow them to char on all sides, with the exception of the limes which only need to char on the cut side. Remove from the grill and allow to cool, then chop the pineapple, red onion and jalapeño into bite sized pieces. Remove the seeds from the jalapeño for a milder salsa. Combine the pineapple, red onion, jalapeño, cilantro and olive oil in a bowl, then season with salt and squeeze in the juice from the grilled limes. Mix together, taste, and adjust seasoning as needed, then set aside. Remove the fish from the bag, then wipe off most of the marinade, leaving a light coating behind. Be sure to clean the grill after grilling the fruits and vegetables and rub it down generously with oil. Drizzle the fish with a bit more oil and gently rub to distribute. Place the fish on the hot grill and let cook for about 3-4 minutes on each side, depending on thickness. The fish will be ready to flip when it starts to turn opaque around the edges and lifts easily from the grates. 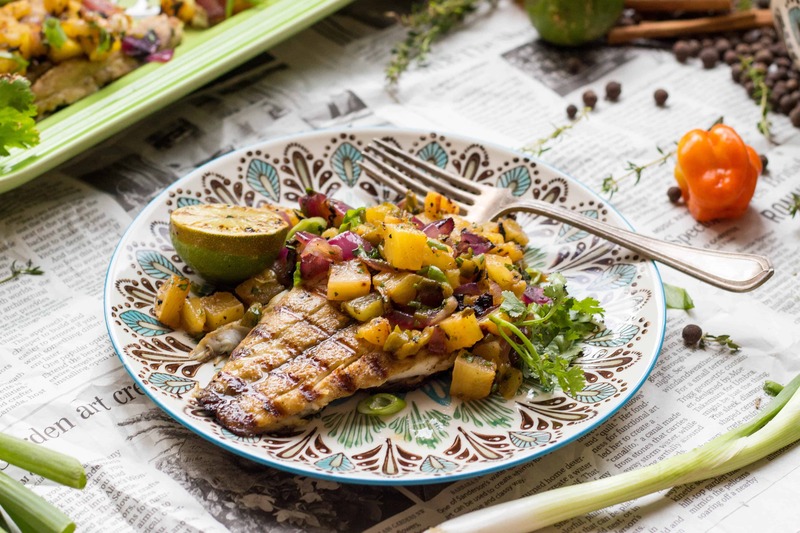 Carefully transfer the fillets to a serving platter and top with the grilled pineapple salsa. Garnish with cilantro and serve with lime wedges on the side. *Scotch bonnet and habanero peppers are incredibly spicy, so handle with caution. It is advised to wear protective gloves when removing the seeds, and avoid rubbing your eyes after touching. **This recipe can be prepared on any grill or grill top, however charcoal will give the best flavor. LOVE the new website Nicole! Thanks for all the great recipes…fun facts..and your fun fun sense of humor!!! 1) This looks amazing 2) The new website looks amazing 3) You = amazing. i adore this recipe! especially for the summer. i never have thought of making a pineapple salsa before, let alone a grilled pineapple salsa – so this is something i have to try! Thanks, Thalia! Nice to hear from you. 🙂 I hope you give this recipe a try, and I’m sure you’ve got plenty barramundi down under to work with!